Satlink to distribute and broadcast Ethiopia's ETV channel. its ETV news channel. The Ethiopian Government owned television channel, whose broadcasts include news, entertainment, music and sports content, will extend its audience reach across Africa, North America, Europe and the Middle East over SatLink’s Global Satellite and Fibre Network. 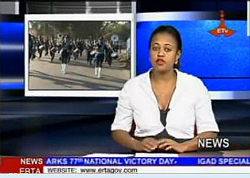 SatLink will broadcast ETV, whose aim is to broadcast informative, educating and timely information of the development of Ethiopia utilising state-of the-art technology, to the African market utilising SatLink's capacity on AMOS -5 C-band to allow them to effectively distribute their content easily to Africa’s multi-channel platforms. As ETV’s partner, SatLink worked closely with the broadcaster in order to help design the uplink capabilities for the channel from ETV’s facilities in Ethiopia on to Amos 5 and ensure the network of satellite’s chosen specifically met the broadcasters needs and achieve the international reach that was required. ETV will also be transmitted across Europe and the Middle East on Hot Bird 13.0° East on the Ku-band. For distribution into the North America market, ETV will take advantage of the Galaxy 19 at 97.0° West Ku-band, which hosts the largest ethnic video platform in North America, to reach the Direct to Home (DTH) ethnic market in the US. ETV is the latest news broadcaster to select SatLink for the global distribution of content joining international news broadcasters such as France 24, i24 News, NTV-MIR and euronews and leading news agencies including Thomson Reuters and APTN.